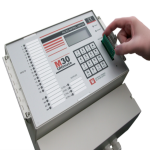 The M30 SMS Alarm Dialer is an rugged machine specifically designed for commercial and industrial conditions. It has over 60 years of alarm dialer design experience behind it and was designed with input from our customers to make sure it had all the features and functions they required. 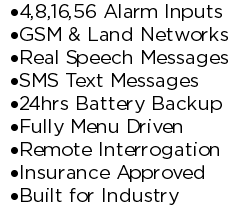 The M30 SMS features include 4,8,16 or 56 individual inputs each with their own SMS or voice message, IP56 enclosure, integrated mains failure and 24+hrs battery backup to name a few (check out a more in-depth list below). 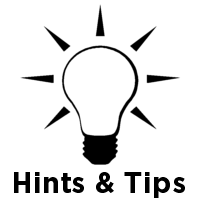 The SMS feature is very easy to setup, when you are setting up the outgoing alarm contact numbers you just select whether you would like the recipient to get an SMS or a voice message, the rest is done automatically for you. Each individual input on the M30 has its own individual SMS message, plus there is a universal machine identification, so you can easily tell where it has come from. So for example instead of getting a generic “Channel 32 Alarm Condition” SMS message you get a much more useful “London Desalination Plant – Low Water in tank 22” message. If required you can also send voice messages to your alarm recipients, this can be over a standard PSTN lane line telephone or via the mobile GSM networks. If you use the PSTN network you can setup the M30 to monitor the line and if it fails, to automatically switch to the GSM network to ensure you always get your alarms out. As per the SMS messages each input can have its own individual speech message. The M30 is designed and built by us in the UK and is fully customisable, so if you would like the M30 to work in a certain way or to have a unique function for your application then we will be happy to create it for you. More alarm numbers – As standard the M30 allows you to have up to 5 numbers in each roster (alarm contact list) but this can be extended to 10 or more. Auto Isolate – M30 automatically turns itself on and off at predefined times and days. Auto Test – The M30 will automatically make a test call on a predefined time and day. Below is a small subset of the standard features on the M30, for a more comprehensive list or information please contact us or visit the standard or optional features pages. 4,8,16 and 56 individual inputs/ channels. Individual user recordable speech and or SMS messages for each input. PSTN and or GSM phone network connection. For more information of the SMS Alarm Dialer visit the SMS Feature page or the SMS section on our Blog. On a Standard M30 on when dialing it will select the Duty Roster set by the User (1,2 or 3). The current Duty Roster selected is shown on the top right of the LCD display (e.g. R1, R2, R3). The Channel to Roster software works differently. When an alarm becomes active, instead of the M30 dialling out on one of the Duty Rosters, the M30 will automatically select a Roster linked to that alarm channel. If Channel 1 is activated it will dial Roster 1. If Channel 5 is activated it will dial Roster 5. If Channel 10 is activated it will dial Roster 10 etc. This software upgrade is great for when you need to communicate different alarms to different people for example the fire brigade for the fire alarm and the maintenance department for the Air Conditioning in the server room. This new feature is available either as an option on a new M30 or as a simple software upgrade on a current machine. As fish farms are typically located in rural and remote locations we have designed our M30 along with our customers input to be the most robust and flexible system on the market. For example the M30 comes with 4 all the way to 56 separate alarm inputs, integrated 24hr plus battery backup, integrated mains failure and low battery alarms to name just a few – To see a full list look below or visit our Standard or Optional Features pages. The M30 now comes with the option to send SMS text messages instead of or as well as voice messages. It is very easy to use, while setting up your M30 you simply select whether you would like the alarm message recipient to get an SMS or voice message. Each input has its own user definable message plus there is a general machine identifier useful if you have more than one site. So for example instead of getting a “channel 1 alarm” you would receive a much more usefully “Windsor Fish Farm Low Water Alarm”. Because it can be difficult to get a PSTN landline to remote locations or get a cell \ mobile phone signal we have provided multiple connection options to the M30. The M30 can connect to either a landline PSTN phone network or GSM mobile network or both to send voice alarm messages. If you choose to use both types, then the GSM network is used as a backup, so if the landline fails or is blocked it will automatically be swapped to the GSM network. As the M30 is designed and built by us in the UK it is fully customisable, so if there is a special feature you would like or you would like it to work is particular way please let us know and we will normally be able to create it for you. More alarm numbers – As standard the M30 allows you to have up to 5 numbers in each roster but this can be extended to 10 or more. As an advanced alarm unit with over 50 years of design experience, the M30 comes with all the types of features you would expect, including free UK based phone support and on the road engineers for servicing, installation and upgrades. 4,8,16 & 56 individual alarm inputs. For more information on our Fish Farm Alarm Systems, help or current pricing and availability please contact us or visit our standard features or auto dialler FAQs pages. 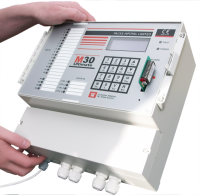 The M30 SMS Auto Dialer was purposely designed for use in harsh industrial environments and was designed with both our 50 plus years of experience and our customers input making it our most robust and feature rich unit to date. The M30 comes with a multitude of features including an IP56 enclosure, integrated battery backup and 4,8,16 or 56 separate inputs (check out more below). Each input has its own individually definable SMS / Text Message, so instead of a “Channel 1 Alarm” you could receive a much more useful “Westbury Landfill – Mains Failure in building 2”. When an alarm is activated the M30 will send an SMS for each active alarm to the preprogrammed recipient. Each M30 also has the ability to send Voice alarm calls over PSTN and or GSM networks. The M30 also comes with free UK based telephone support and engineers available for servicing, installation and upgrades. Remote interrogation from any phone. For more information on our SMS Alarm Systems, help or pricing please contact us or visit our standard features or auto dialer FAQs pages. Our Auto-Dialler the M30 is an advanced industrial machine, which has been purposely designed for use in harsh commercial environments. The M30 is based not only on over 50 years of design experience (Since we built the worlds first Auto-Dialler in 1958) but from input from our customers. 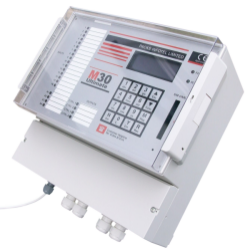 The M30 allows you to use both a standard PSTN and or GSM phone network conditions to get the alarm messages out. The M30 gives you 3 options dedicated PSTN, Dedicated GSM or PSTN with backup – the M30 will automatically switch to the GSM network if the PSTN land line fails or is blocked. Each input in the M30 has its own individual user definable Speech or SMS alarm message, this means that instead of getting a generic alarm message “Channel 4 Alarm Condition” you get a much more useful “Fan Failure in Shed 4”. 4, 8, 16 & 56 individual alarm inputs / channels. Because the M30 is built by us in the UK if there are any special features you require for your project we can normally create them for you. The above is only a small subset of the available features on the M30 Auto-Dialler; for a complete list visit the Standard Features and Optional Features pages or contact us for a quote.